What would your work day be like without email, being taken back to the days of just mail, fax, or courier? How about your calendar app or CRM, leaving you with just a planner and a rolodex? Imagine getting your news by word of mouth or – gasp – a newspaper. Go back to processing your printed receipts with your desk calculator and ledger. 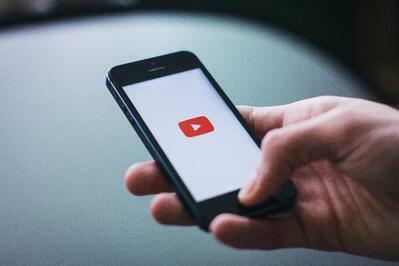 Try thinking about how you’d manage all your data without spreadsheets and pivot tables, or collaborating on a presentation without access to the cloud. How about running a marketing campaign and getting no data to prove ROI, or sending a press release and manually tracking media placement. This is a life without software. It’s a life without instant communication. Without automation. Without dashboards or analytics or reporting. Fortunately, this isn’t the world we live in. Despite the distractions of social media and a lightning-fast news cycle, we’re more productive and making more data-driven decisions than ever before. Software touches everything we do, particularly at work. But because software is more integrated into our lives than ever, it is also taking a larger role in our happiness as employees and humans. 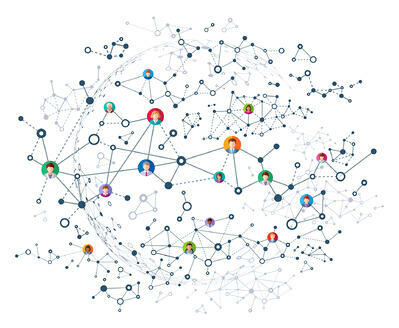 The right software can help us create and scale businesses, or earn a promotion. The wrong software can cause us to waste time and grow frustrated – even to the point of leaving a company. To get a better understanding of the impact software has on employees, G2 surveyed more than 1,600 people in its State of Software 2019 study to get a better understanding of the effect the right – or wrong – software can have in the daily lives of workers. In 2019, employee retention is of utmost importance. The U.S. unemployment rate is historically low, sitting between 4.1% and 3.7% for all of 2018. Studies vary a bit but say that the average cost to hire a new employee is between $4,000 and $7,600. And for highly technical positions, such as artificial intelligence-focused jobs, there can be massive shortages of qualified professionals. Keeping that in mind, companies should be doing everything in their power to keep their employees happy. Some are: For instance, nearly two-thirds of companies expect to increase their spending on employee engagement technologies to combat this.. 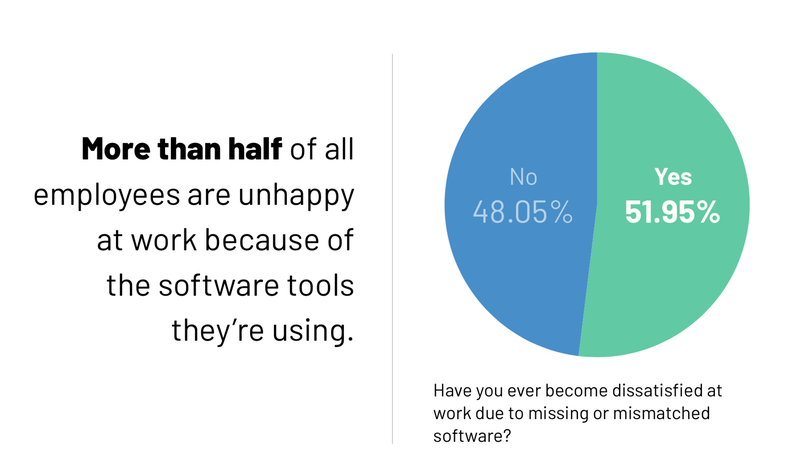 Yet, in 2019 many people surveyed believe their employers’ software selections are affecting their happiness. More than half of all employees have become unhappy at work at some point due to the software tools they’re using. 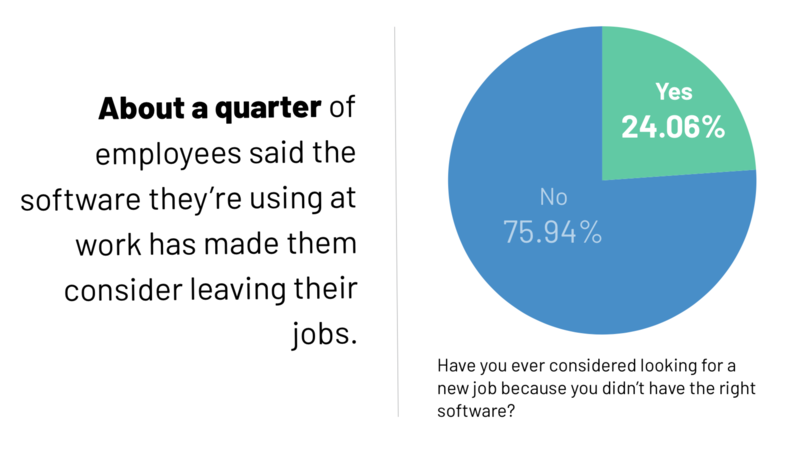 Even more worrisome for employers is that roughly one-quarter of those surveyed the software they are required to use at work has made them consider leaving their jobs. 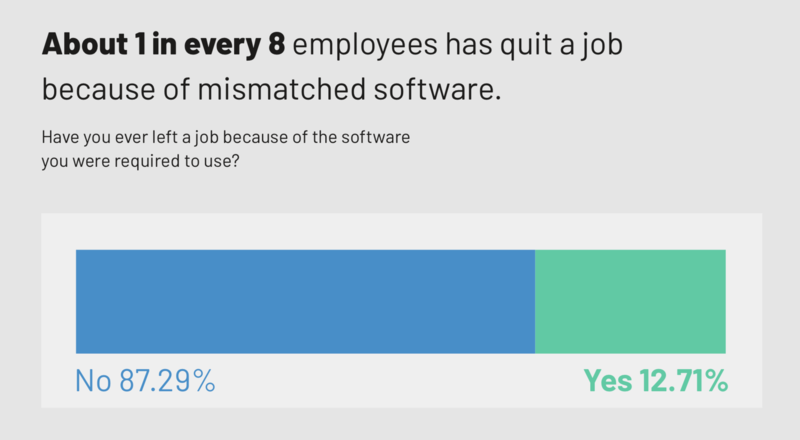 And more than one-in-eight employees has left a previous job over mismatched software. Overall, the majority of employees surveyed indicated that their happiness at work could be impacted by having both the correct software for their role and, to a lesser extent, more software to do their job effectively. In the not-so-distant past, software was far less ingrained in the lives of employees. But with the widespread adoption of the cloud and explosion of software-as-a-service (SaaS) companies, there is no question of its influence on daily life. 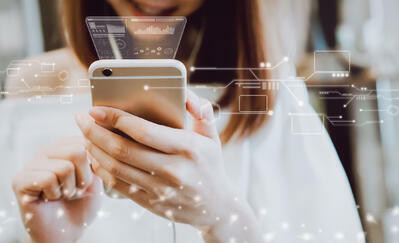 Software isn’t just found on the work desktop – it’s available anywhere an employee can access the internet, including their mobile phone. Nearly 95% agreed or strongly agreed that software can make them more productive at work. But that doesn’t guarantee happiness, as 62% of employees have felt like they were not reaching their professional potential because of the software they used at work. Finally, more than half of all respondents said that their software has a direct impact on their personal lives: More than 56% agreed or strongly agreed that having the right software at work allows them more free time outside of work. While the software employees use can have a direct impact on their happiness, productivity, and even retention, the majority do not believe they have a say in the applications they use throughout the day. 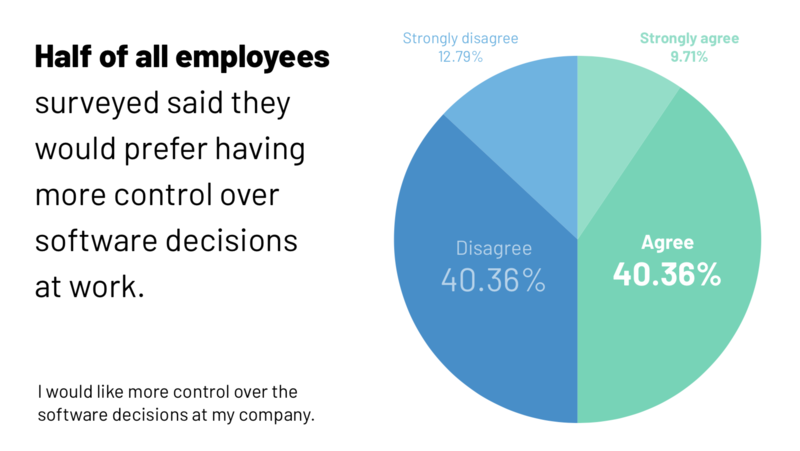 Of those surveyed, less than 30% said they felt like they had control over software decisions at their company. That also has an impact on employee happiness: Half of those surveyed said they would like more control over software decisions at their company. Employees are using a lot of software, and more than ever, but it’s not always the right software. Sometimes they don’t even know all the tools at their disposal. By providing the right software for their employees, businesses can help enable their employees to be happy and productive. In the era of the cloud and SaaS, businesses have more software choices than any time in history. Their software choices have more potential than ever to impact their employees. 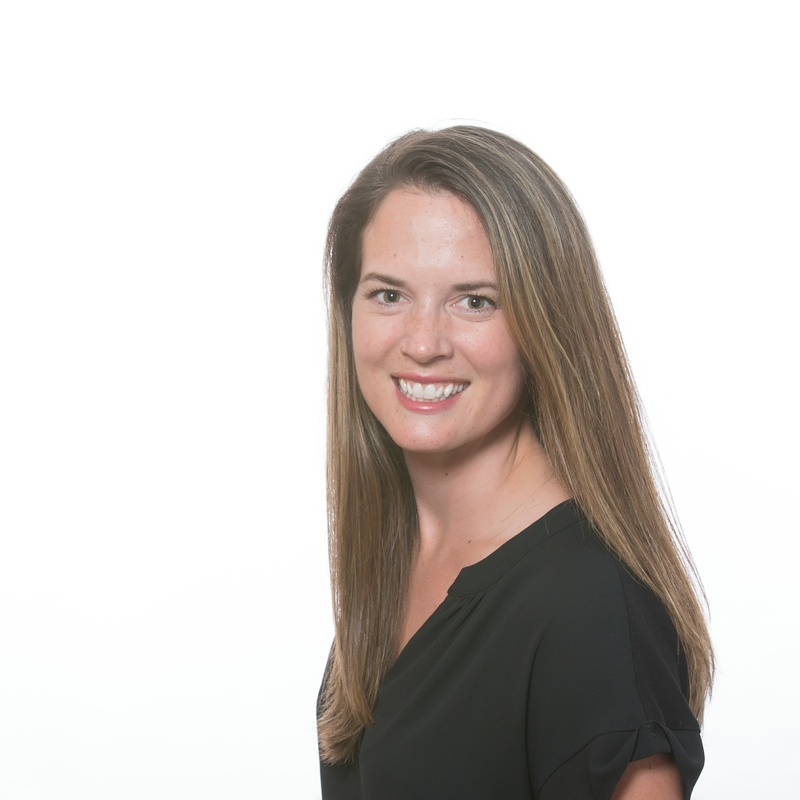 Lauren is Sr. Director of Product & Brand Marketing at G2 Crowd. When she's not working with an amazing team of marketers, you can find her exploring Chicago with her husband and pup.